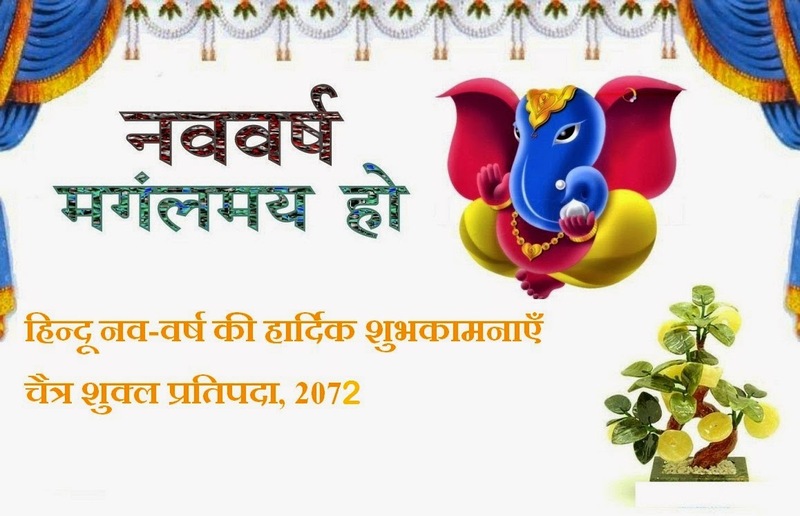 Vikram Sanvant 2072 is going to begin from 21st March, 2015 the new year of Hindu Religion. The hindu people start their new year from Gudi Padva, or 1st day of Chaitra Navratri. Yes Chaitra Navratri also going to begin from 21st march, 2015. वर्तमान में शनि वृश्चिक राशि में वक्रीय स्थिति में है, जो 2 अगस्त को पुन: मार्गी हो जाएगा। विक्रम संवत्सर 2072 में शनि किस राशि पर क्या असर डालेगा.जानिए आने वाला साल आपके लिए कैसा रहेगा. Aries :- Saturn will be moving from eighth place from your sign in Vikram Sawantashar. Saturn’s Dhaya is moving. Enemies may create problem due to eighth place of Saturn. You may face health issue. On the other hand, business and job conditions may fluctuate. The goal would be achieved after great difficulty in job and business. Saturn will remain in retrograde position which may create big loss. It might affect your family or a close relative or friend. Such work cannot be completed. There might be property related disputes. Saturn’s eye on fifth place may create problem for children. Boss and official will be unhappy with your work. Wear 5.25 ratti’s blue sapphire in gold, silver or copper ring. You can wear Saturn’s Yantra along with turquoise gemstone in throat. It is also a good measure. Keep fast on Saturday. Feed flour to ants. Donate shoes, black clothes, coarse grains and iron pot. Taurus:- Saturn is on the seventh place from your sign in Vikram Sawantashar 2072. It will improve your health but may be someone in the family is likely to have disease which causes you to be worried. Dispute in the family members may increase. Distance between husband and wife may increase. This year may be good for business and jobs. You may get benefits. Your colleagues, boss and office would appreciate your work on the job. Falling of an elderly member’s health may cause stress for you. Excessive trust on someone may lead you to loss. Do not take decision in hurry until Saturn curve position (2nd August). You may have foot pain. Make black iron ring with black horseshoe or marine boat nail. Keep it in sesame oil for 7 days till Saturday and chant 23000 mantras. Wear it on Saturday evening. Wear this ring in the middle finger. You can wear it in Pushya, Anuradha, Uttara, Bhadrapad and Rohini constellation. You have to chant or chant with Brahmin 23,000 mantras of Saturn. Gemini :- Vikram Sawantashar 2072 will be provided progress for Gemini. Saturn will be on the sixth place so you will defeat your enemies. You will find many accomplishments this year. Gemini will work this year and they also get its fruits. The plans were made to increase business now it is the time to complete it. You will also pursue opportunities in the job and business. Boss and officials will be happy with your work. You may get stress due to health of elderly member as Saturday’s retrograde position till August 2nd. You will get advantage of your investment which you can do after August. Time for the family will be good after August. To reduce the side effects of Saturn combine 7 types of grains and pulses and feed the birds. Keep blue color fragrance handkerchief with you. Do not stand in front of the lord Shani. Stand aside to see him so that you do not have direct sight of lord Shani. Wear 5.25 rati’s blue sapphire in gold, silver or copper ring. Cancer :- Saturn will in your firth place during Vikram Sawantashar 2072. So this year will give you the progress. Friends and colleagues will assist you in your work. You will fulfill your ambitions by using new techniques and skill in job and business. There are chances of getting new opportunities in your work. You may also get promotion on the job. Students should focus on their studies. The relationship between husband and wife will be sweet. Dispute may occur between brothers. Take care of your food. Health will remain relatively good. Do not take any decision in anger or hurry. Beware of enemies and conspirators. Take bath before sunset on Saturday and light a mustard oil lamp under banyan and peeple tree. Also offer milk and incense stick. Take root of the Bichoo grass and wear it on Saturday in Shravan constellation or in auspicious time of Shani Jayanti. You will get rid from many problems. Worship lord Shani with following 10 names. Konastha Pingalo Babhru krishnou Roudraanthako Yamaha | Sourihi shanaischro Mandha Pippalaadena samsthu thaha || It means: 1) Konastha 2) Pingalo 3) Babhru 4) Krishnou 5) Roudraanthako 6) Yamaha 7) Sourihi 8) Shanaischro 9) Mandha 10) Pippalaadena. Problems will remove by chanting this mantra. Leo :- You may be impacted of Saturn’s Dhaya in Vikram Sawantashar 2072. So this year cannot be good for you. You may get some loss in job and business. There might be new work plan but it won’t work. This year you would suffer the brunt of anger boss. You should do your work carefully. However, time is good for family and friends. Family members will be with you in difficult times. Student should concentrate on your study. Child’s behavior, study and marriage may cause anxiety for you. You should take care of your health. Drive carefully and think before investing in the business. Lord Shani is pleases to serve the black cow. Tie Rowley on her head and Kalawa in his horns and worship it. Take round of cow and feed four laddoo of the rain. Keep fasting every Saturday. Worship Hanuman after sunset. Use vermilion, black sesame oil and its lamp, blue flower in worship. Virgo :- Vikram Sawantashar 2072 is beneficial for Virgo sing. However, they may face health issues. Chronic disease can re-emerge. Jobs and business conditions will remain in your favor. You may get big advantage in business. The financial condition will improve. The money will remain inward. The situation in the family will be satisfactory. There will be harmony between husband and wife. You can get a significant position in the job. Some people may become jealous of your progress so you should remain careful for that. You may get stress due to health of your parents. This year, you can go on many trips. These trips will increase tension. Time is good for student. Feed laddoo’s to the monkeys and black dogs. The effects of Saturday would be less. You can also wear ring which is made from black horseshoe or boat nail. Soaked the black gram in water on Friday night. Tie up the gram, raw coal, and small piece of iron in black cloth and flow it in fish pond. Do this measure for one year. Do not eat fish during this time. You can chant or chant with Brahmin Shani mantra for 23,000 times. This mantra is “Om pram Preem Proum Sah Shanaischaraya Namah”. Libra :- Saturn’s effect on Libra is clearly visible in Vikram Sawantashar 2072. Health problem can increase this year. Additionally, because of the Saturn in the money place you may get financial losses. You may find difficulty in Jobs and business. You will find difficulty in all work and will be disappointed. Working people should remain careful as enemy of colleagues may put false allegations against you. Happiness remains in the family. It is good year in family matters. Family members will help you in adverse situation. Yoga would be beneficial for your health. Drive the vehicle carefully. Soak quarter black gram in three different pots on Saturday. Then take a bath, wear clean clothes and worship lord Shani. Put mustard oil in black gram and offer it to lord Shani and pray for your troubleshooting problems. Feed first quarter of black gram to buffalo. Donate second quarter black gram to leprosy people. Third quarter black gram should be peel off from your head and hide it in secluded place. You will get relief in outbreak of Shani. Tie up quarter black coal, an iron nail in black cloth and peel off from your head. Flow it in water. Scorpio :- There would be effect of Saturn in Scorpio in Vikram Sawantashar 2072. There may be conflict in jobs and business. You will remain under pressure to meet targets. After working hard you will not be able to make happy your officials. Saturn is retrograde till 2nd August which creates health issues. This year will be better for you in terms of family. There may be auspicious occasion in family. There may be lack of coordination with the boss in job. It would be better to aware with opponents. You should think before invest in the business. Control on unnecessary expenses. You will get upset due to less fruit even though hard work. Established and worship Shani Yantra on Saturday. You should worship him every day so that lord Shani can be pleased. Light a lamp of mustard oil every day in front of Yantra. Offer blue or black flower and you will get more benefit. Wake up early in the morning on Shani Jayanti or Saturday. Take bath and sit on the Kush (Grass). Keep statue or picture of Shani and worship it with Panchopchar. Do rosary of following mantra for 5 times and worship for prosperity. If you chant this mantra every Saturday you will get benefit soon. Vedic Mantra: Om Shanno Devirabhishtya Apo Bhavantu Pitaye Shanyorabhi Sravantu Nah. Sagittarius :- There will be effect of Saturn’s Sade Sati on Sagittarius sign in Vikram Sawantashar 2072 which resulted in frustration and negativity. An old disease may emerge again. Conditions are not in your favor in jobs and business. Business partner is cheating on you. Keep an eye on the activities of employees. Friends and colleagues will assist you. Health of family member may undermine. You work hard but you will not get favorable results. If you are thinking about to expand the business then you may find difficulties. Economic conditions remain weak. You may have to take debt. Overall, the effect of Saturn’s Sade Sati will appear on job, business, home, family and health. Chant Hanuman Chalisa on Saturday at any Hanuman temple and pray for the peace of Saturn’s problem. Also offer bundi laddoo. Flow 11 whole coconuts in water on Saturday and pray to lord Shani for happy life. Take a bath before sunset and light a mustard oil lamp under banyan or peeple tree. Also offer milk and incense stick. Capricorn :- Vikram Sawantashar 2072 will give rise to Capricorn. You can also get some good news this year. Saturn will be dynamic in your sign at eleventh place. Saturn may create problem for you as it is in retrograde until 2nd August. During this time, drive carefully. This year will be better for you in terms of health. Over confidence may lead to loss in business. You will get support of friends and colleagues. Enemies will not survive in front of you. However, throughout the year the money will remain fluctuate. Home-family environment will be favorable. Take root of Shami at home with ritual. Wear it on throat or tie up in shoulder in black thread on Saturday auditory or on Shani Jayanti. Shani will be pleased as well as the problems of Saturn will fix. Wear root of Bichoo grass in black thread on Saturday auditory or on Shani Jayanti. You will get success in all tasks related to Shani. Aquarius :- Saturn will be moving on tenth place in Vikram Sawantashar 2072. Saturday’s rotation will give you good fruit. This year your sources of income will increase. It’s time to realize which you are thinking to expand your business plans. This year will also be good in financial matters. This year you will get full support from friends. You may receive bad news during the 2nd August as Saturn is retrograde. You should take care of your health. Government employees may face loss due to negligence. This year students may not get success. Saturn effect decreases by feeding sweets to monkeys and black dogs on Saturday. You can also wear iron ring which is made from black horseshoe or boat nail. You can also wear blue sapphire or turquoise gemstone in throat. It will also beneficial. Offer Chola to Hanuman on Saturday. Use mustard or jasmine oil and light a lamp from these oils. Pisces :- Saturn will be in ninth place in your sign. You may get opportunities for your progress. The task which you will take you will definitely complete it. This year luck will support you. The plan which you created to expand the business may be completed. You may get job opportunities. Officers will be happy with your work. This year you will plan for an important task. Enemy may create problem during 2nd August as Saturn is in retrograde position. This year will be good for you in terms of health and family. You will get support from friends. Take 2 breads and keep oil on one bread and ghee on second bread. Keep sweet on ghee bread and feed to black cow and feed other bread to black dog. Worship lord Shani during this time. Take bronze bowl and fill to with sesame oil in it. See your face in it and keep black urad, 1.25 Kg pulses, two sweets, fruit, black coal and iron nail in black cloth. Donate them to Dakot. Which Thing is Lucky For your Sunshine? Kyon Hote Hai Grah Vakri?